There was a time when Liu Fenghai had 25 craftsmen working exclusively on elephant ivory at his factory in the northern city of Harbin. Now, to the delight of conservationists everywhere, China is calling a halt to this legal, state-sanctioned trade. But Mr Liu, as you might expect, is far from happy. "I feel sad," the 48-year-old said. "I don't feel good at all. This tradition has been carried on for thousands of years but now it will die in the hands of our generation." "I feel like a sinner," he added. "In a few hundred years time, we will be seen as the sinners of history." In fact, although ivory carving can indeed be traced back centuries in China, for much of that time it existed only as a niche art form and the Chinese made barely a dent in the global ivory trade. Throughout the 19th and 20th Centuries, the mass slaughter of elephants was carried out at the hands of the European colonial powers and then later North American entrepreneurs. Then came Japan's post-war economic rise and the slaughter was propelled through the 1970s and '80s, by which time the elephant was teetering on the brink of extinction. Once again though, it was another major shift in the global financial order that signalled further disaster - China's emergence as a major economic power. An explosion of wealth coupled with the Communist Party's unique blend of corruption and crony capitalism made ivory the perfect repository of value, both for ostentatious displays of success and discrete gift giving. An art form became an industry and in a few short years China began to account for up to 70% of the global demand for ivory. 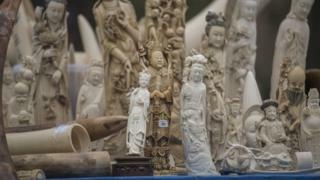 If Mr Liu believes it is a sin to lose an ancient art, how much more of a sin to lose an ancient species in the name of the mass-produced - often machine-carved - ivory tat that makes up the bulk of the products on sale in China today? Not a moment too soon, the Chinese government has decided which side of history it wants to be on. This week, by the end of business hours on Friday, almost half of China's authorised, government-approved ivory factories and shops will have closed their doors for good. The rest of China's legal trade will be gone by the end of the year - a total of 34 factories and 138 shops. It is a deeply symbolic moment, a "game changer" according to campaigners, with one of the most high profile and vocal, the UK's Prince William, publically applauding the Chinese government's decision as "an important commitment". No small irony, perhaps, given the role the prince's own ancestors played in promoting the trade, with more than 1,000 ivory items still held in the royal collection. 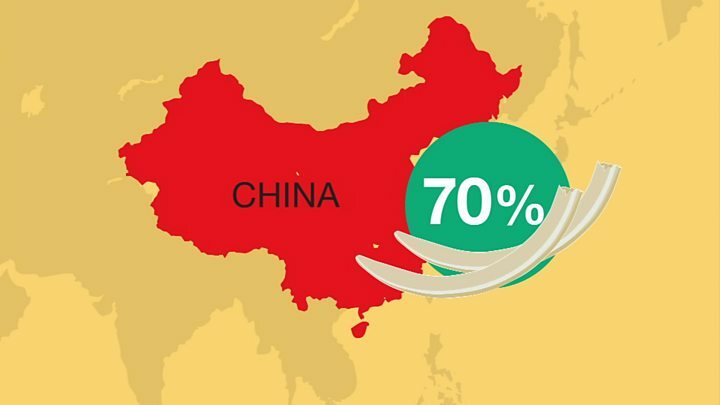 But closing China's carving workshops and retail outlets is so important, it is argued, not only for its own sake, but because this legal business acts as cover for a much bigger black market trade. In 2008 China was allowed, under the Cites system, to buy a 62-tonne stockpile of African ivory. The theory was that, with careful monitoring and a system of certificates, the stockpile would provide a controlled supply to China's factories and therefore dampen demand for illegal ivory by helping to keep prices low. Now, although there are undoubtedly other factors at play - not least the slowing Chinese economy and the crackdown on official graft and gift giving - the announcement of the ban on the legal trade does appear to be helping to bring the speculative frenzy to an end. "Trust me, I've never had any problems before," one of the online vendors said, after sending us pictures of rhino horn bracelets. But now, after decades of defending ivory carving as an intangible cultural asset, the Chinese government is finally turning its back on it. It has decided that the diplomatic advantage in joining the growing international consensus far outweighs the relatively small economic value of the industry. Its decision will put pressure on other jurisdictions that continue to allow a regulated, domestic ivory trade to do more, most notably Japan and Hong Kong, but perhaps also countries like the UK. But, however significant, no one believes China's decision will bring an end to elephant poaching. That goal will only be accomplished when there is a shift in the attitude of consumers in China and other countries where the demand remains high. And while there is promising evidence to show that public information campaigns are working, it will take time. In his office above his ivory shop in Harbin, complete with a footstool made from a severed elephant leg, I ask Mr Liu if he agrees that elephants are more beautiful alive than dead. "I don't agree," he says. "Ivory is the best material for carving art. Even if it is as small as a grain of rice, you can carve a poem on it." "You cannot say an elephant is beautiful but a piece of ivory is not."